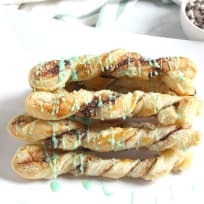 Mint chocolate cinnamon sticks are an easy sweet treat. The chocolate mint combo in buttery puff pastry can’t be beat! Learn how to make Homemade Irish Cream Liqueur that tastes even better than store-bought. It makes a great gift or you can keep it on hand to make cocktails or to sip over ice. It doesn’t get more Irish than a hearty, traditional Irish stew. 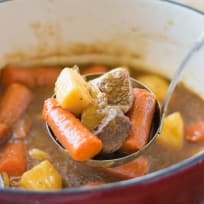 Tender chunks of lamb, carrots and potatoes are cooked with herbs in beef stock for a simple, yet deeply flavorful dish. Mint chocolate chip whoopie pies are just the right amount of green to make them perfect for St. Patrick’s Day. They whip up easily thanks to this festive Silpat baking mat – that you can win! This chocolate Guinness float is pretty hard to resist. All that chocolaty flavor in one boozy drink! 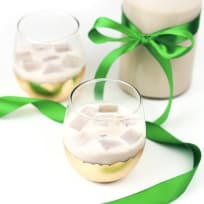 The nutty Irishman cocktail will make toasting your Irish heritage more fun than ever. With Irish whiskey, Irish cream, Frangelico, and strong coffee, it’s an after dinner drink you’ll love well beyond March. Chocolate stout cheesecake is sweet and salty, with a crushed pretzel crust. Pour yourself a pint and a slice – you can drink your beer and eat it too! 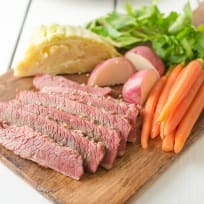 Reuben Soup combines all the flavors of the classic sandwich into a creamy soup. You'll want to lick your bowl clean! Chocolate stout mousse with whiskey cream the perfect dessert to add to any St. Patrick’s Day celebrations or just when you feel like treating yourself to something the kids can’t get their hands on! Grab a spoon and dig in. Irish cream fudge is perfect for St. Patrick's Day. An after-dinner treat that's just for grown-ups! Steak and Ale Pie just in time for St. Paddy’s Day! This seasonal favorite makes dinner a star.